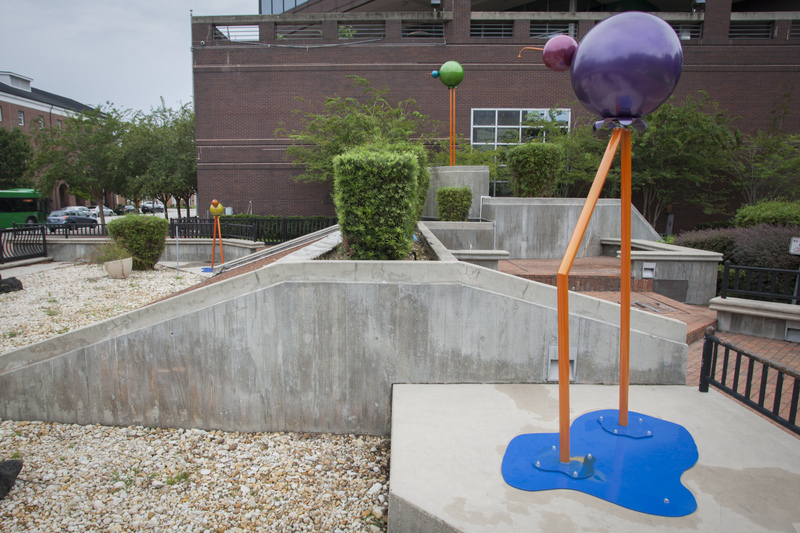 Three vibrant chrome-finished bird sculptures titled Aviary by Gainesville artist Jenn Garrett are on display at the Orange County Government’s Administration Center. Three vibrant chrome-finished bird sculptures created by Gainesville artist Jenn Garrett are on display outside of the Orange County Government Administration Center in downtown Orlando until the fall. The sculptures, titled Aviary, will find their permanent home at Young Pine Community Park when it opens in east Orange County later this fall. Garrett’s bird installation display was coordinated by Orange County Arts and Cultural Affairs Director Terry Olson for the public to enjoy temporarily in downtown Orlando. Young Pine Community Park will feature Orange County’s first inclusive playground, which helped inspire the art. Aviary showcases three rounded, playful bird forms, developed around the idea of imaginative play. They are supported by pipe legs, allowing some of the birds to turn for a kinetic dimension. Each bird form has different abilities with the green sculpture being bigger and taller with straight legs. The medium-sized purple bird has a bent leg and the smallest yellow bird has outstretched legs. The whimsical nature of the work will complement the playground and will spark the interest of children and adults alike. The gathering of several birds symbolizes the idea that Orange County welcomes a diverse group of park-goers in their parks. For more information on the art installation, contact Orange County Arts and Cultural Affairs at (407) 836-5540.